In attempts to be a speedier seamstress for my cruise wear, I thought to myself on Sunday “Geee, I bet I can cut *this* corner.” Come Tuesday night, I regret this decision. I had a moment on Sunday where I thought to myself, I’m just going to cut into my fabric… I’m sure pre-washing linen won’t really matter. I started cutting the fabric and begun assembly on Monday night. I had just finished constructing the waistband when I got to thinking long and hard about this skirt. While I wanted to attach the waistband, given the sewing instructions for it, it’s going to be terribly hard to remove once it’s stitched together (since other pieces get stitched to the waistband afterwards). What this means… if there’s any shrinkage in the fabric, I’m S.O.L. It will be a pain to unpick the waistband since I’d have to unpick the front plackets where the buttonholes go, and to to that I’ll have to let out the hem. 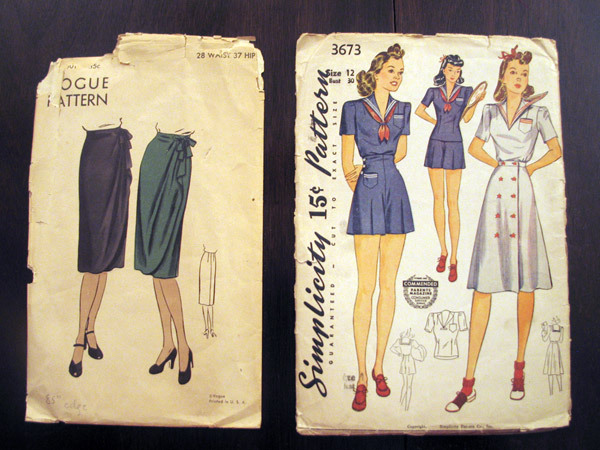 Hence my blog post title today: Good Seamstress vs. Bad Seamstress. I started out thinking I could cut this corner, but when it get’s down to it: OF COURSE linen is going to shrink!!! What was I thinking?!? I’m just glad I had this thought before stitching up the waistband and before I do my final fitting! I prewash nearly everything else, I’m not sure why I thought I could get away with it for this linen skirt. Being a good seamstress, I spent the rest of the night serging all of my seam allowances so I can throw this in the wash without it unraveling on me. Hopefully tomorrow night I can attach the waistband and let it hang so I can hem it. I’ve never tried it, but I’ve seen several other people suggest pre-treating wool by throwing it in the dryer with a damp towel. I’m planning to try that on some wool because I can’t stand the thought of trying to hand wash and line dry wool yardage, either… I’m sure it would just end up covered in dog hair and crazy wrinkly! Ooh, that’s a really interesting suggestion, I think I may have to give that a go too! I do that, works a charm! Always the same with buttons – never quite the right shade! I prewash all my fabric as soon as it gets home for exactly this reason! Otherwise I’m in too much of a ~hurry to wash it before cutting, and then I debate ever washing it at all (for reasons of shrink). Of course, my older stash fabrics are pre-prewash phase, so I do still catch myself debating whether or not I want to postpone my project another day while it goes through the wash.
And I never prewash my wool. I will throw it in the dryer with a wet towel to give it some shrinkage action, but it’s not like I wash my wool stuff (and I especially don’t take it to the dry cleaners), so it’s not really a concern. Wool is so awesome and anti-smelly haha. One time I had a few yards of what I thought was a cottonish wool, one of those unknown handmedown fabrics that was unclear in a burn test. I washed it and sewed up a pair of pants, thinking any shrinkage would have happend in the washing process. I was wrong! I really liked the pants, until I washed them again. 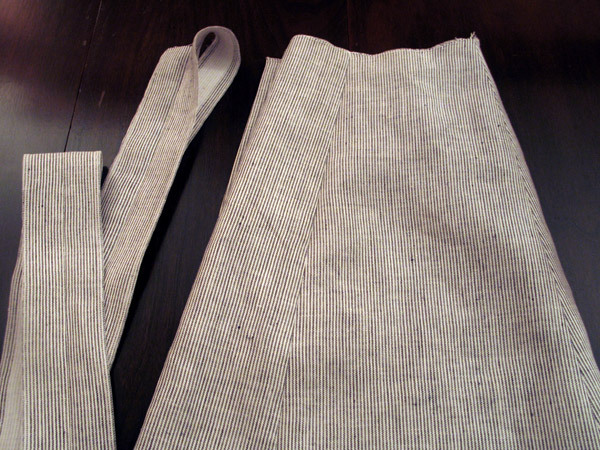 The pant hems shrunk a full four inches. I had four inches of lining hanging out of the bottom of the pants! They went in the scrap pile. It was very sad. I never used to prewash my fabric either!!!!! One dress I made from cotton sateen, I got too excited when I bought it so I cut into it right away when I got home. I wore it, washed it then wore it again and noticed the lining was was peeking out…. cos the dress had shrunk a couple of centimetres… gah!!!! I always pre-wash my fashion fabric, but I have on occasion forgotten to pre-wash my lining fabrics with annoying consequences. I’ve done it enough times now to have learnt my lesson though (I hope). I was also taught in sewing class to pre-shrink interfacings by hovering a very steamy iron over the pieces (sticky side up) before ironing them on. Watch how low you hold your iron though because the pieces can have a habit of jumping off the ironing board and sticking themselves to the iron! I’m never quite sure how strictly necessary this step is, but I’ve never been brave enough to risk spoiling days of effort by skipping a couple minutes of work. P.S. I found you blog by googling “fish eye dart”. I’d never heard of it being called that before. Good luck with your cruise wardrobe. It’s (more than?) half the fun of a cruise! I hope the fabric comes out of the wash okay. I’ve done that before, thinking I could get away with not throwing some jersey in the dryer. Epic fail in the chest area afterwards. Eep! If you ever need buttons, I can bring my box to you – I think I might have enough for both of us!